Season one of Veronica Mars is nearly flawless because of flaws. It’s charming and funny and entertaining, but it also doesn’t shy away from complexity, from the bad decisions and the ugly conflicts that develop at various times in peoples’ lives. Its characters are flawed and human, and the way the show handles them is similar to the idea behind the Lilly Kane memorial video at the beginning of the season: at first, you may expect the saccharine, but you realize that the most moving memories are created because we see them for who they are. We see Logan as sweet and vulnerable, but we also see him as angry and bitter and sarcastic, a victim of abuse and an emotionally pained individual; we see him as someone who is simply himself–positive or negative–someone who, even if it may seem sometimes that he can’t be trusted, is a perfect fit for Veronica. We see Jake and Celeste Kane as parents who lost their daughter, but we also seem them as parents who assumed the worst about their son and tried to cover up Lilly’s murder. We see Duncan as someone who can become dangerous in a heartbeat, but we also see him as someone who remains by Veronica’s side as she watches the incriminating tapes. We see Lilly Kane as someone who slept with her boyfriend’s dad, but we also see her as a good friend and an endearing presence. Most importantly, we see a father and a daughter who embrace after the results of a paternity test are revealed. Veronica signs the contract immediately because to her, it doesn’t matter if Jake Kane is her father; Keith is who she knows and loves and accepts, and him actually being her dad is a beautiful, heartwarming, and simply right thing. When he asks “Who’s your daddy?” at the end of the episode–a question that was used to bookend the pilot and to give us a sense of the complexity the show would explore–Veronica can know with certainty that he is. In fact, this is a man who literally runs through fire to save his daughter, who is nothing like Aaron Echolls (revealed to be the one who killed Lilly). Here’s perhaps the most impressive aspect of this finale and of this season: Aaron as the killer makes complete sense, but the way the show develops him over the course of the season seems to be in relation to Logan more than it is to the actual case. Veronica never suspects him, but the clues are all there, and I, for one, was surprised. Going off that last point, when Veronica actually does find out, she’s placed in a position that she never thought she would be in. She’s always been able to outsmart people, to use her wit and her intelligence to her advantage, but it’s just a simple fact that she’s no match for Aaron Echolls physically; because she never suspected him, it’s another gut punch for her, and the last fourth of the episode becomes a horror film when he shows up in the back of her car and punches her through a glass door (idiot) and locks her in a box and sets the box on fire. Yet, what distinguishes this sequence from a derivative slasher sequence is the fact that all these characters are well-realized, the fact that Veronica’s still quick-thinking–she puts the tapes in three different places–and the fact that it all comes down to that Keith-Veronica relationship. Here, Keith saves Veronica by fighting Aaron and opening the box, but Veronica also saves Keith by putting out the flames and stopping Aaron from escaping. The aforementioned fight scene is very well handled, the lack of background music lending to the visceral impact it has. Eventually, Keith saves his daughter, and Aaron is run into by a truck with a lily painted on the side; it’s nice that Lilly gets to enact some justice of her own. At the same time, the characters in this show must come to terms with the past, with the pain and sense of loss that will never cease to exist. Logan is standing on a ledge, beckoning Weevil toward him, Jake Kane is screaming at Aaron as he’s being arrested, and Veronica’s telling her mother that she needs to leave. They must all accept that Lilly’s dead, that whatever fantasies they might have had about perfect, loving families or friends–about the past–must become focused on the people they have right now. And so, Veronica and Lilly sit next to each other in that pool, wanting this moment to linger forever. As the sun shines and as Veronica looks around, though, there is closure. She knows her friend is gone, but Lilly will keep on floating among those water lilies, smiling and having a blast as she vanishes into the water. “I was hoping it would be you,” Veronica says as she opens her door, and we fade out on a new beginning. 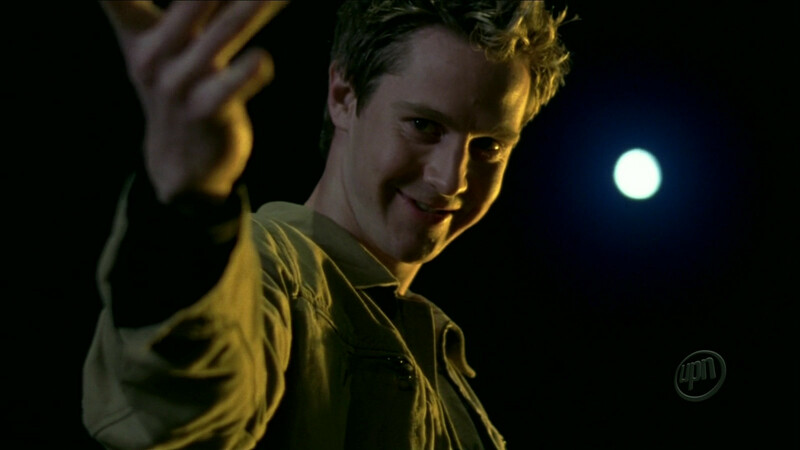 -Fitting, isn’t it, that Lilly Kane’s final line is one that threatens Aaron Echolls’s image? She says something about sending the tapes to news networks, and what follows is Aaron striking and killing her. This image-preoccupied man was introduced as such at the beginning of the season, and it’s a big aspect of the finale. “I won’t let a 17 year old ruin my life”: he can’t believe that someone who should be fawning over him, Big Movie Star, would wind up taking him down. It also really says something that when Logan wanted to take Veronica someplace private in the last episode, he ended up in a room with cameras and with his father’s face all over. He’s trapped here, and Veronica’s later trapped by the same person as well. -Also: you could say Aaron gets more cartoon villain-y in the episode, but I would argue that it all fits in with the idea of him being an actor. -Aaron’s way of getting rid of evidence: throwing it into the pool right next to the victim. -Jason Dohring’s performance in that beach scene is heartbreaking. -Yay! More inspirational voice messages! I love these. -The Keith-Alicia scenes in this episode are superb. -No pen explanation here, but it, according to Rob Thomas, contains an angry letter from Weevil to Lilly about their past relationship that, if found, would instantly push him up a few spots in the suspect list. – “How many episodes of NYPD Blue did you have to watch to get the finger-tapping down?” Lamb vs. Logan. I love it. -Even Backup gets in on the action, and rightfully so. -That does it for season one of the show, now one of my favorite television seasons of all time. This finale was also one of the best I’ve seen. I look forward to covering seasons two and three in the future. I loved Veronica way back when and treated myself to the DVDs for Christmas!